If you are looking for Miami-style luxury in the North Miami beach communities, look no further than 14th and Ocean, Pompano Beachluxury residences! These resort-style townhouses, located NE at 14th Street and Ocean Ave. in Pompano Beach, FL, are still in the development stage and they will be home to 21 exclusive luxury residence opportunities located directly across the street from The Atlantic Ocean. Located at the corner of 14th Street and Ocean Avenue, 14th & Ocean is not just a clever name for these waterfront Pompano Beach villas for sale; it is a gateway to all of the beautiful luxury Pompano Beach has to offer. Each and every villa at provides a small neighborhood feel but with all of the luxury amenities accustomed to the big Miami condos. 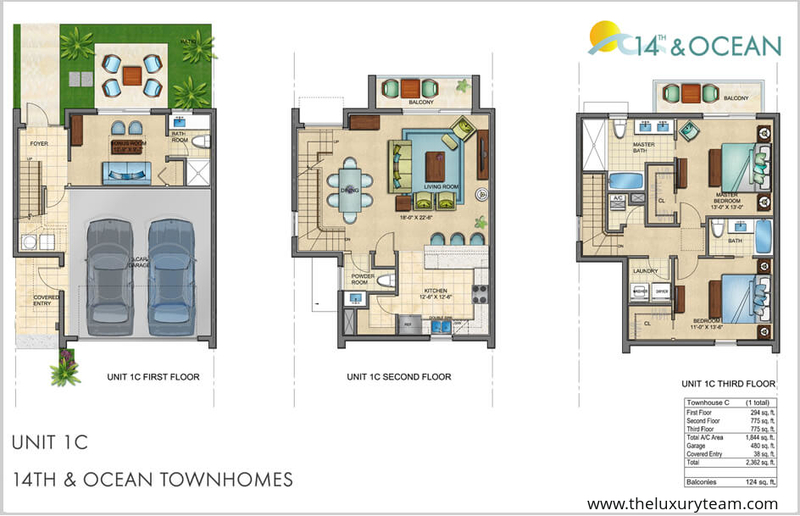 The spacious and beautifully –landscaped property consists of four three story structures, all identical with spacious 4 bedroom, 3.5 bathroom floor plans. Each and every luxury residence at 14th & Ocean in Pompano Beach features spacious flow-through designs with expansive open kitchens, open balconies, an private fenced in rear patios. 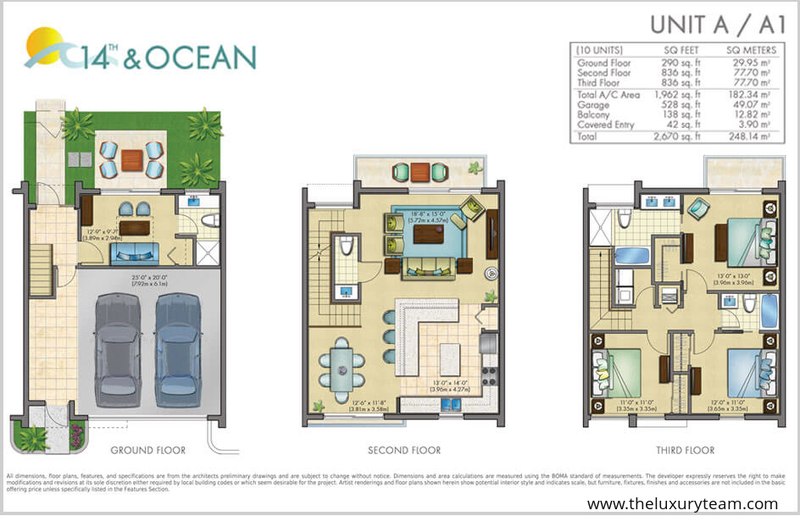 Units range from 2,394 to 2,532 square feet and range from 500-600k. Its sleek and contemporary design will also include floor-to-ceiling impact resistant glass windows, designed to maximize natural light and make heating/cooling the most efficient. Built in 2015, each and every unit includes the very best in modern amenities, appliances, and design. Every unit at 14th and Ocean is pre-wired for smart home technology and push-button control of all functions in the home from your smart phone or tablet. And, you’ll never have to worry about parking, as a covered 2 car garage comes standard for each and every community member. Also, you can enjoy the sunrise from your private balcony overlooking the Atlantic. 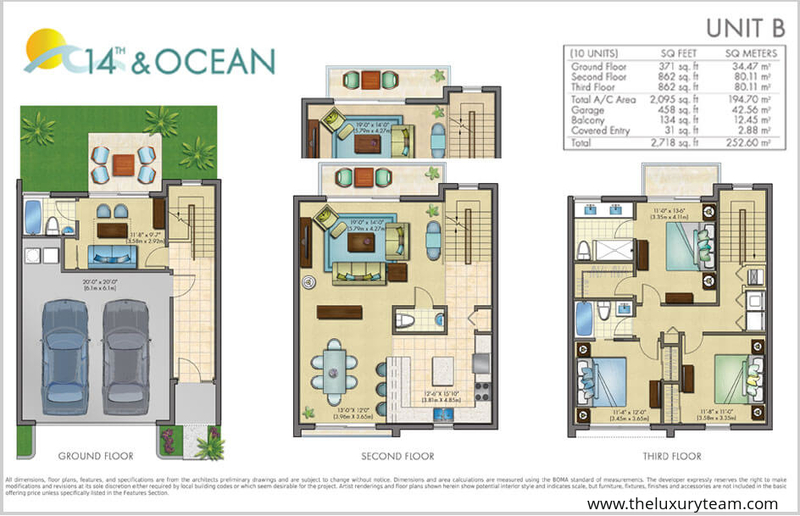 14th and Ocean is an ideal luxury location for anyone hoping to become part of a wonderful community in Pompano Beach. When you leave your villa at 14th & Ocean the luxury doesn’t stop there. Each and every resident has full access to the gym and sauna areas, BBQ area, and heated resort-style pool. Lounge poolside or overlooking the ocean in the distance in your fenced off cabana area, complete with lounge chairs and space to entertain friends and family. It is the small town community atmosphere that are bringing more and more people to Pompano Beach, but now you don’t have to skimp on the luxurious amenities. For the golfer in the family, 14th & Ocean is just minutes away from the newly-redesigned Greg Norman Golf Club, one of the most highly acclaimed courses in all of South Florida. Also just a few blocks north from the Atlantic Boulevard corridor, you will be just blocks from the best Pompano Beach has to offer in dining, shopping, nightlife, not to mention just a short drive from Fort Lauderdale, Miami, Sunset Beach, and more! Don’t miss out on this opportunity to have Miami style luxury in growing and exciting Pompano Beach!